Fenugreeks leaves rich in bitterness are loaded wit lots of medicinal benefits. It is easy to cook and easy to grow. In Mumbai vegetable market Fresh methi available every day but not in Kerala. 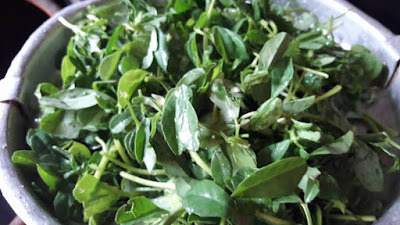 so I grow my own feenugreek leaves , within 15- 20 days i get fresh fenugreek/ methi herb . you can lead a healthy life if you add fenugreek powder or sprouted fenugreek or fenugreek leaves more than 2 to 3 times in a week in your food. The fenugreek leaves are used as medicines. In kerala household using fenugreek Seeds spluttered (tadka) in fish curry, moru curry also in chiken curry too, almost in all morru / dahi/ yoghurt curries fenugreek are used in cooking. Sprouted fenugreek has super medicinal properties. Maharashtra famous dinkache / methiche ladoo, methi seed laddu is traditional Ayurveda ladoo making from this fenugreek seed. Today in my kitchen thepla ”… Theple is a popular Gujarati Cuisine. 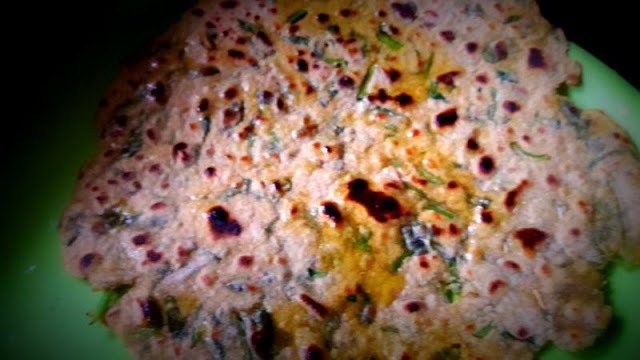 Gujrati Thepla is made from Fresh Methi Leaves, Whole Wheat Flour, Gram Flour and spices. “मनुष्य केवल रोटी ही से नहीं, परन्तु हर एक वचन से जो परमेश्वर के मुख से निकलता है जीवित रहेगा।” मत्ती 4:4. Jesus Christ emphasized this when he said: “Man must live, not on bread alone, but on every utterance coming forth through Jehovah’s mouth.”—Matthew 4:4. Wash, Rinse and finely chop the Fresh Methi Leaves and keep it aside. Take gehun ka atta (whole wheat flour) and besan in a mixing bowl. Add all the spices and herbs. Mix it well with hands. Knead it with hands to make dough using Luke warm water. Cover the dough and keep it aside for 10 minutes. 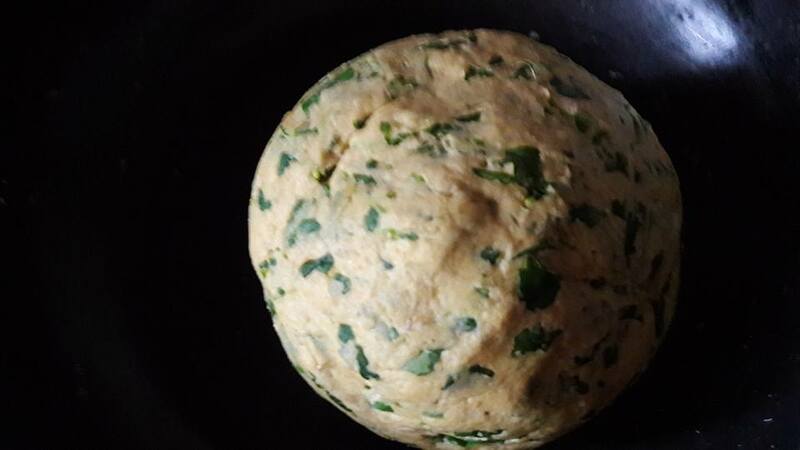 Divide the dough in small balls to make flat thin chapati. Sprinkle some flour over the small dough balls and start rolling it with a rolling pin. Put flat thin Theplas over hot tava to cook. Flip it when one side is half done. Apply oil on both sides of thepla and press it with spatula. 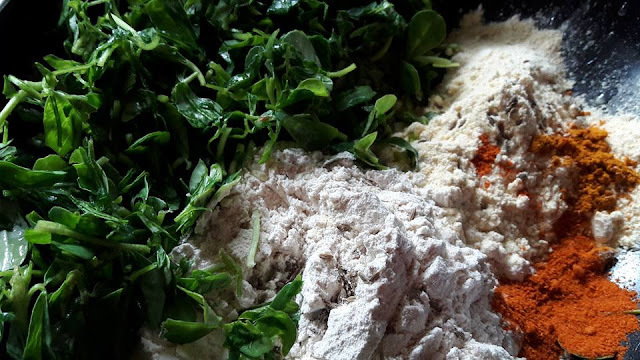 You can add Spinach puree, Pumkin paste , dhodhi (bottle hourd) or leafy veggies is same Recipe. Curd make theplas Soft and Delicious. You can add ragi flour or oats flour to make it more healthy.